Temporary child custody is a request to the court or order from the court giving someone custody of a child temporarily. When going through the long process of permanently obtaining custody, temporary custody is generally awarded. In all cases regarding child custody in Florida, the court makes all decisions based on the child’s best interests. Custody battles begin with a petition filed with the county circuit court. Normally custody battles come about due to dissolution of marriage, more commonly known as divorce. In this situation, at the beginning of the divorce proceedings, a judge will have a hearing to determine which parent will receive temporary custody of the affected child or children. This hearing will establish a signed agreement between the parties divorcing or a court order awarding temporary custody. Normally, a court will not change a child’s routine unless it is in the child’s best interest to do so. The other reason that many custody battles come about is due to a father or mother seeking a paternity case to establish both parent’s custody rights and child support issues. Rarely is any temporary custody awarded in a case like this because generally the child is already established with one parent. The only time temporary custody may be awarded to the other party is if there is an issue that places the child in a home where it is not in the child’s best interest to be there. One of the most common petitions filed with a court in a custody battle is for an extended family member to take custody of a minor. This requires a Verified Petition for Temporary Legal Custody of Minor Children form. Chapter 751 of Florida Statutes covers this form. The form itself is relatively easy to fill out and contains the name of the petitioner, address, name(s) of the children involved along with place of birth and birth date, and the petitioner’s relationship to the minor child. In addition, the child’s current address and names of both parents must be provided on the petition. Along with this form a Uniform Child Custody Jurisdiction and Enforcement Act (UCCJEA) Affidavit, Family Law Form 12.902(d), must be filed. Other information on the petition includes the person wishing to gain custody of the child, the circumstances of the child’s current living conditions. Also, a claim that it is in the child’s best interest for the petition to be granted, the amount of time for the temporary custody, and reason for that particular amount of time. Finally, the petitioner can request visitation by one or both parents, a visitation schedule, and child support for the child while he or she remains in temporary custody. If the parent consents to the information provided on the petition then they can submit a Parental Consent to Temporary Legal Custody of Minor Children form. This form lets the court know that the parent agrees with the petition for temporary custody. 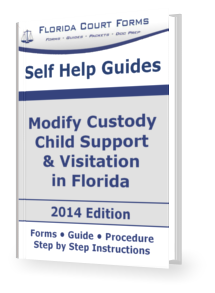 The UCCJEA Affidavit lists background information on each child involved in the custody case and information about the petitioner in terms of background with child custody issues. All of these forms must be typed or printed in black ink and be notarized or filled out in front of the clerk of the circuit court. After the court makes a determination on the petition, it will issue an order on the petition granting temporary custody and defining the terms of the custody or denying the petition.